Many people suffer from pain and tension in their joints and muscles, and our modern lifestyle further increases the problem. This causes great discomfort, reduces life quality and makes us unhappy. People try various methods to eliminate this problem, and things like home saunas or hot tubs can be helpful. However, when discussing this topic, one type of product stands above most others – infrared heating pads. They are praised by both therapists and users, because they create heat that penetrates deep into your muscles and joints, helping improve circulation and eliminate pain. Choosing the best infrared heating pad shouldn’t be that difficult, and for this reason we’ve created a buying guide to discuss important features you should look for. We have also selected fantastic products to give you solid options, so don’t miss out. 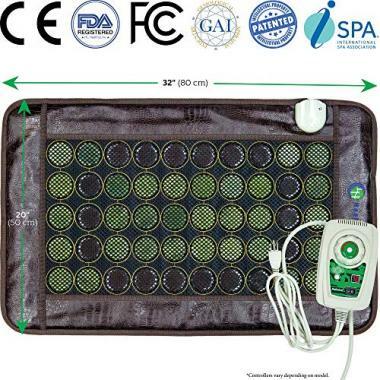 We start with an excellent UTK infrared heating pad which measures 21x31 inches. It’s a versatile product which can be used to treat any body part. A total of 126 stones are used in making this jade heating pad, and in addition to far infrared heating it also produces negative ions. It’s FDA approved, and you can adjust both time (15 minute intervals) and temperature (103°F-159°F by 1°F increments). It’s very soft, flexible and comes with Velcro straps to securely attach it. UTK customer service is available 24/7 and you also receive a 1-year warranty on the product. All things considered, it’s probably one of the best far infrared heating pads on the market right now. HealthyLine gives us a very popular product which has a total of 50 gemstones on a 32x20in surface. To boost the healing effect, they use a combination of Jade and Tourmaline stones. You will also get an LED-display controller, a mylar foil sauna bag and a carry bag with the purchase. 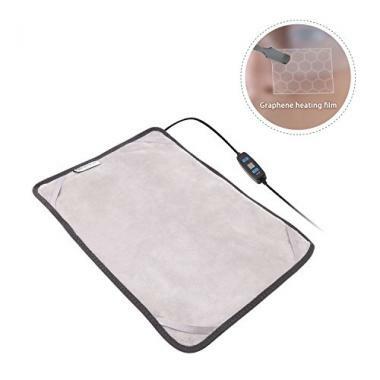 This top rated far infrared heating pad is made of non-toxic materials, and the surface is very soft and comfortable. Finally, it’s made in the USA, and you get a 1-year warranty with a free 30-day trial period. This is an interesting product for several reasons. First of all, the design is a bit different compared to others – it uses graphene films to produce far infrared rays. It’s very efficient, but thanks to this solution it’s also very affordable. The maximum temperature is 140°F, and you can choose among three temperature settings. As an added bonus, it comes with an adapter which converts the electricity into 12V output, which is much safer to use. Finally, the surface area is only 12x15 inches, making it very easy to take with you anywhere you go. 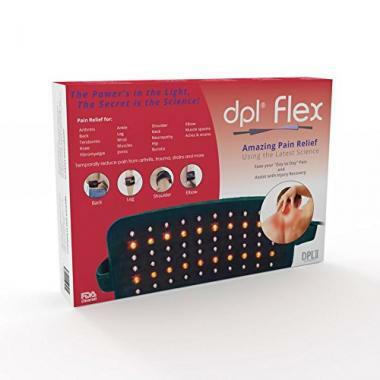 The DPL flex pad is another unconventional heating pad on our list. It uses 60 medical grade LEDs which emit infrared rays and soothe your pain. It’s FDA approved and works well on any body part. ReVive claims that you will start feeling better in just 15-25 minutes of using this product. To be honest, it is pretty nice to use, especially since it has strong Velcro straps to keep it in place. MediCrystal creates high-quality infrared pads, more powerful than others. This one is made of 18 layers, and uses only natural purple Amethyst crystals. The surface measures 32x20 inches, but at 10lbs it’s heavier than the competition. It comes with a smart controller, a waterproof cover and a nice carry bag among other things. The manufacturer gives you a two-year warranty and a reliable customer service if you encounter trouble. Even though it’s a bit more expensive, it’s definitely worth the money. 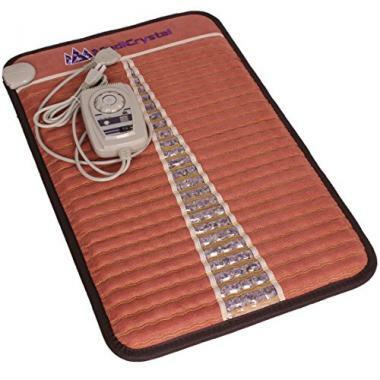 This infrared heat pad guarantees fast pain relief thanks to the 135 jade stones that are built into it. The product is FDA approved, and gives results in just 30 minutes. You get it with a smart controller which allows you to set the temperature and also the shut-off time. It’s ready to use quickly – it heats up to 70°C (158°F) in under 5 minutes. Finally, you get a nice carry bag and a 12-month warranty if you decide to buy this pad. Here we have another product that is easy to wrap around any part of your body. In addition, it’s one of the most budget-friendly products we featured in our infrared heating pad reviews. Weighing only 1.2lbs, you won’t even feel it on you. It’s effective and comfy to use, and most people say they had good results after just a couple of weeks of regular use. There are 3 heat settings, and the pad will shut itself off after 30 minutes to prevent potential injury. Here we have one more product from MediCrystal, and this comes with a very large surface. 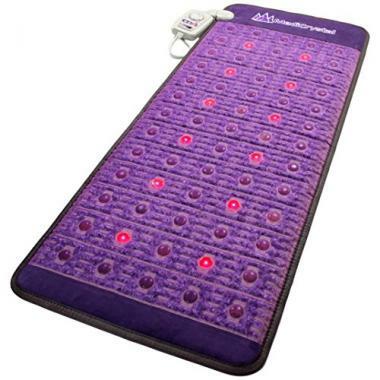 Made of Amethyst crystals and red LED lights, this is the best infrared heating pad if you’re looking for something to lie on. It’s composed of 20 layers, with a luxurious surface. You can easily select the temperature using the controller, and also the length of your session. 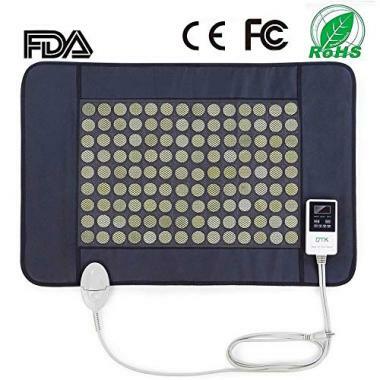 This infrared heating mat is an excellent product for your daily relaxation, and comes with a 1-year warranty to give you some peace of mind. Since infrared heating pads are designed to improve your wellbeing, you should pay close attention to specifics details when buying. This means you need to consider the type of pad you’re getting and whether it’s suitable for your painful area in terms of size, shape and efficiency. Furthermore, it needs to be comfortable and easy to use. Take a look. As you already know, an infrared heating pad can be used to treat different parts of your body. Some are very large and universal, so you can lie or sit on them. In fact, there are many similarities with sauna health benefits, in terms of how your body reacts. 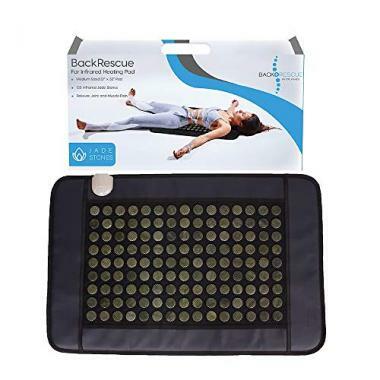 If you want a more concentrated effect, you should get a heating pad specially designed for a particular body part – lower back, knees, elbows, shoulders and neck. Some have Velcro straps to keep them in place when using them, which is a plus. In addition to FIR (Far Infrared) heat, these pads also produce negative ions which are said to have the ability to additionally boost your health. These ions interact with your cells and improve metabolism, hormonal balance and help heal various diseases. The output of these ions depends on the type and number of stones found in your pad. Research shows that Amethyst and Tourmaline stones emit the largest amount, but it’s also important to have a large number of stones in your pad if you want an increased effect. How powerful your pad is going to be depends on the design, number of stones, heating system and overall size. It makes sense that larger pads with more stones are going to be more powerful and able to treat larger areas, but they are also less practical and not very energy-efficient. 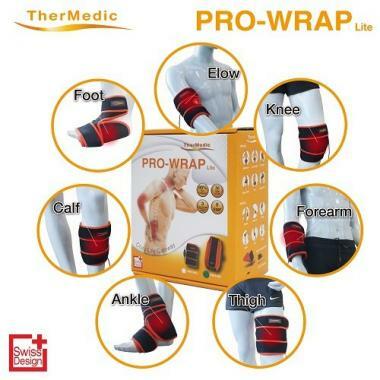 You can rest assured that all of the products we featured are powerful enough to generate heat which is able to reach the painful areas in your body. Weight also varies greatly from one product to the next, where some weigh under a pound while others are many times heavier. Lightweight pads are great if you need to wrap them around a part of your body, because they won’t weight you down. They are also more convenient to carry with you, and some even come in nice carry bags. It’s certainly a huge plus if your new heating pad allows you to adjust heat settings and personalize your therapy. Some heating pads have two or three heat settings to choose from, while others come with controllers that allow you to precisely set the temperature you want. Lower heat is better for long sessions, while higher heat is good to get you warmed up quickly. This adjustability allows you to get many of the same advantages of a sauna. However, you need to pay attention to session time too, because you may get burns on your skin if you get too carried away. In addition to temperature settings, it’s more than useful if your controller allows you to set the time limit of your session so you don’t have to track time yourself. Some products can memorize your settings so you don’t have to adjust them every time you use the pad. Choice of material is also very important, because this determines the level of comfort you’re going to have when using the pad. It needs to feel nice and soft, and not irritate your skin. Manufacturers usually choose synthetic materials such as polyester, but some have cotton surface. Furthermore, it’s a plus if the casing is removable. This way you can wash it in a machine and always have a clean heating pad when you wish to use it. Q: What Is an Infrared Heating Pad? A: It’s a specially designed pad that creates infrared light which heats certain parts of your body. In fact, it works similarly to infrared heaters, but much closer. Unlike standard electric heating pads, infrared pads are able to warm up deeper tissues of your body, thanks to a greater penetrating power which is usually somewhere between 4 and 8 inches. Q: What Are The Benefits Of Using An Infrared Heating Pad? A: There are many benefits, but the most important ones are that infrared heating pads relieve pain and leave your body feeling good afterwards. The processes that happen in your body during this time are similar to those when you spend time in an infrared sauna. Your blood vessels widen, which improves circulation and the heat boosts metabolism on cellular level. All this improves muscle and joint flexibility and relaxes your body. Stress hormone levels are balanced and your body stays in that relaxed state. Furthermore, it can help with weight loss too, because the body temperature and heart rate are increased which in turn burns more calories. Q: How Do Infrared Heating Pads Work? A: Infrared heating pads have wire elements and gemstones inside a casing. When plugged into an outlet, the wire elements heat up the stones, which in turn emit infrared rays and negative ions. It’s an effective design, proven to have many benefits to human body. Of course, it makes sense that a larger amount of stones in your healing pad is going to create a larger amount of energy. Q: Is Infrared Heat Dangerous? A: No, you are perfectly safe to use infrared heating pads. If you are worried about electromagnetic radiation, you will be happy to hear there is a very small amount present – much less than when you’re walking outside on a sunny day for example. In addition, manufacturers add extra protection which eliminates this radiation completely so it doesn’t reach your body. However, there are other things you need to be careful about. Using the heater for too long or setting temperatures which are too high may cause burns on your skin. For this reason, always be sure to read the instructions and use the pad properly. As you had the chance to see, this is an exceptional product which can make your life much easier. It’s more than simple to use, and it will take the pain away allowing you to return to your normal activities. However, finding the best far infrared heating pad depends on what you’re looking for and the type of problem you have. We hope we made the choice a bit easier for you, and we’re sure you’ll be more than satisfied with your new pad! Have you tried an infrared heating pad that made it onto our list? Did it help eliminate pain? Was it easy to use? Please share your experience with us in the comment section below.